This is not a WordPress driven website, so our hands are somewhat tied on this site. This website is created and hosted through StorageUnitSoftware.com. We were hired to help with the SEO (Search Engine Optimization) on this website. V’s Self Storage simply weren’t coming up at all for self-storage in Iowa City until the 5th page of Google results. Currently, it is still not on page one, but we are expecting to see it finally make it because at the present time it is numbers 1 and 2 on page two of SERP. Usually, when you see stacking domain names they will jump up a level in time. 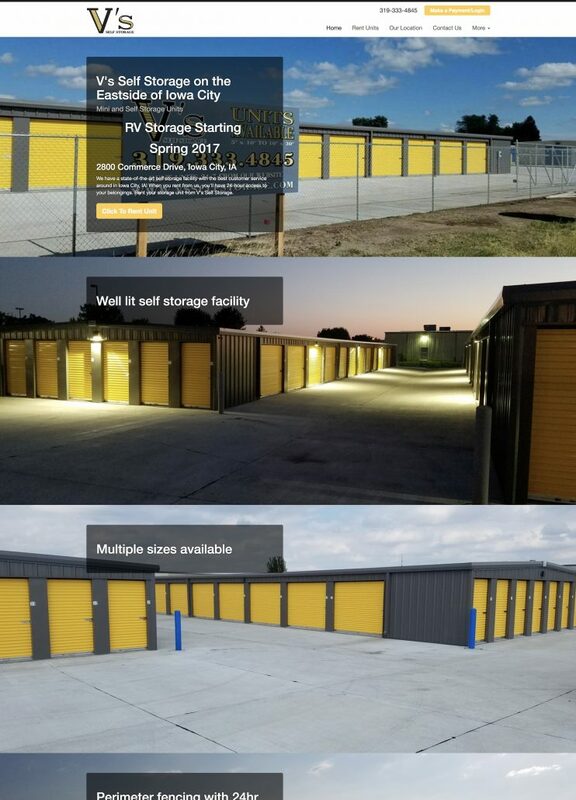 The programmers at Storage Unit Software weren’t indexing the site properly and I reached out to the owners. The sitemap was missing pages so search engines never indexed any of the blog posts that the previous SEO person had created. I had to verify ownership and manually get Google and Bing to index the pages.